Good Medicine! • Run Hard. Rest Well. The real life version of Tetris! Who says video games can’t help prepare a brain for adulthood? 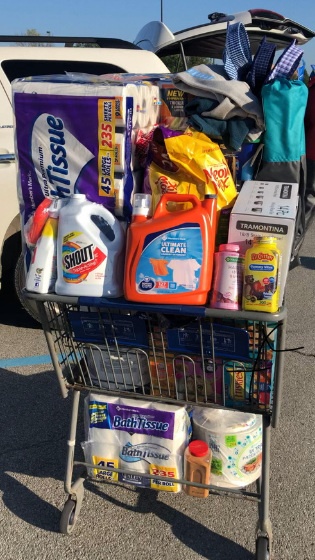 I really hate to brag, but here goes…Not a thing fell out of my overstuffed cart; I didn’t knock a single item off a shelf with my large load; I never ran into any shoppers (though I did hear a few exclamations of, “whoa!” from those around me. That’s called admiration, people); and I never clipped a tight corner even though I couldn’t see a blasted thing as I navigated the aisles. Look, I may forget to pick up some of my kiddos from time to time; I may forget to make dinner some evenings; my kids may wear the wrong uniforms for a sporting event; I may even forget to shower for like a week. BUT, Every. Single. Time. I will totally nail loading my cart “just so” at Sam’s Club. Hey my friends, we are all winners in some capacity. Increase your T cells, which will help you fight 60% of common diseases!